The sea gives us a glimpse of one of it's little jewels on each dive. A hammerhead swims up from below the murky thermocline to give us a once-over, then disappears back to where we cannot go. A school of jacks, thick enough to blacken the waters above our heads engulfs us, making us one of their numbers. A school of Mobula Rays glide by, into the current, probably just making fun of us clumsy, noisy interlopers helplessly pushed in the opposite direction by the tidal change. On each dive, we were given one wonderful event, something to remember and talk about until our next foray. The final dive on the last full dive day, the ocean gave us her finale, like a small town fourth of July celebration, holding back the real show until it matters. A manta cruising past a resting black tip shark, a school of hammerheads, large and small, off in the distance as a backdrop. The Jacks, endlessly faced into the current swarm around us one last time. Then the show is over. On our last morning dive, the sea reminds us she is not one for ovations. The show is over and it is time to leave the theater. 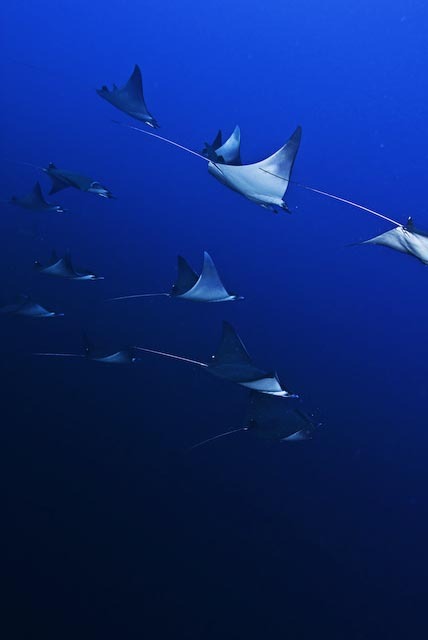 For the intrepid dive traveller, the person who has seen the soft corals of Fiji, the Mantaâ€™s of Kona, the hammerheads of Galapagos, Layang Layang might prove a disappointment in that there is no abundance of any particular â€œspeciesâ€�. Surprisingly though, it is the pleasant surprise of seeing that one thing on each dive which kept me smiling. 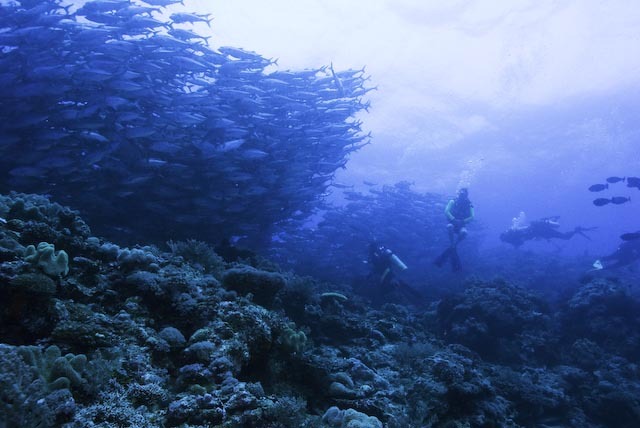 All the diving sites are on the outside of the atoll with the dive shop on the protected side. There is a house reef, but it is small and mostly sand as it too is on the protected side of the atoll. There are three dives per day from the boats with a night dive offered each night for an additional cost. The boats are comfortable and quick, making the farthest site no more than a half hour ride. The resort does not have nitrox facilities, it is air only diving. The dive staff are wonderful, and our divemaster and guide Aster showed that sixth sense for finding critters one gets only after diving an area for years. She would point out into the blue at what I saw as nothing, but sure enough, 10 seconds later there was the animal in question. Visibility was fair for this part of the world, and Aster said it was strangely murky for this time of year, a theme which has followed me the last two months throughout Indonesia. Of course, coming from southern California, 80 ft of visibility in my mind does not constitute â€œmurkyâ€�. Not being able to read your gauges is murky. The resort itself is quite nice and the entire staff are wonderfully warm and inviting. Itâ€™s not that â€œIâ€™m being paid to smile so Iâ€™m smilingâ€� kind of pleasant; these people seem genuinely happy you have come to spend a week or two. There is a family feel here I have not experienced anywhere else. I was invited to participate in the nightly frisbee tournament, frisbee golf, frisbee football, frisbee whatever, with the staff and guests all running around and having a great time together. Layang Layang seems to attract a younger crowd, possibly because it falls into a budget category not seen at most other resorts, and also begets the title â€œthe UN of dive resortsâ€�. The week I have been here, every country on the planet has sent a diving representative. It has made for wonderful conversation, inventive pantomime and sometimes just a pleasant smile and nod. My dive buddy, Watanabe, speaks no English and I speak no Japanese, yet we have had a wonderful time together, despite the fact that we know absolutely nothing about each other. He could be the capo di tuti capi of the Yakuza for all I know, but I got a picture of him with a manta over his head, so we are best buddies. I asked another dive boat compatriot, who as it turns out is a Dutch professor of Indonesian and Malaysian history, if he knew how the resort came to be. I will share with you what he told me, although I cannot verify the accuracy of the information. Apparently, the waters around here are rich in oil, natural gas and heavy metals. The rights to these riches was, and continues to be hotly contested by several nations, so Malaysia built up this atoll and put a naval base and landing strip on the dredged sand spit. As a forward military presence apparently does not guarantee ownership of land or sea, an implanted civil society was required to make the claim legitimate in the eyes of the world. Thus came into being the Layang Layang Resort. Sounds plausible to me, but Iâ€™ll leave the veracity of this claim to those interested in actual research. Here we must keep in mind that Layang Layang is a budget conscious resort. The food is buffet at each meal and the â€œwesternâ€� food is rather bland. I cannot speak towards the â€œeasternâ€� fare as the thought of fish stock soup for breakfast does not appeal to me. However, on Friday night, just as I was about to write off the culinary offerings as a Jenny Craig conspiracy, we have a barbeque that was no less than fantastic. There are no wait staff per se, so if you want a soda, beer or other libation with your meal you head off to the bar, which is 10 steps from the dinner table and get it there. The restaurant staff clean up the tables and are quick and efficient. You put down your fork and head to the desert table and by the time you get back your place is clean of dishes. I do not consider any of this a detractor to the resort, and have lost my winter fat without feeling starved. You just donâ€™t feel the need to go back for seconds, thatâ€™s all. The rooms are quite nice with a small patio with sliding glass door, television (I never turned mine on so I donâ€™t know what is offered), air conditioning, and private bathroom with a shower. When I refer to Layang Layang being a â€œspitâ€� of land, I really mean it. You can practically spit from the ocean to the lagoon. The layout is: Ocean with rock retaining wall, landing strip, resort 20 yards from the edge of the runway, pool, dive shop, lagoon. Flying in to the resort has a whole new meaning for me now. With that said, not once did I hear a plane land, have to pause in mid conversation or pantomime due to engine noise, or was even aware that the landing strip was active. The briefing we received on arrival included the request not to stand on the runway between 7 and 9 am as that is when the cargo, passenger and military planes come in. Good advice. Besides, the staff line the runway when a plane is landing to make sure no guest becomes part of the prop wash. 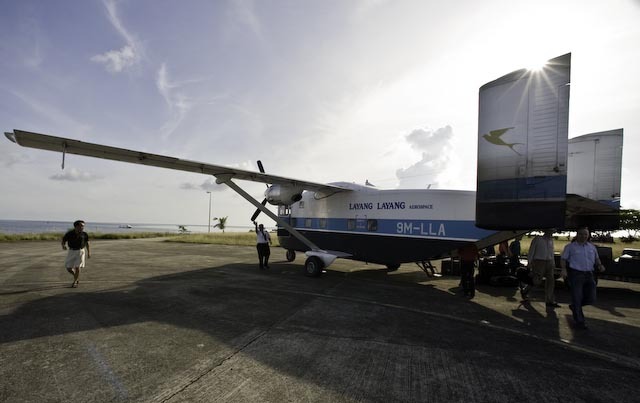 The plane which ferried us to the island is the only aspect of this operation I would question. Affectionately named â€œLayang Layang Aerospaceâ€� the contrivance we flew in seems just a decade younger than a Sopwith Camel. There was a Russian couple sitting across from me during the flight in and I thought the woman was going to hyperventilate herself into a stupor when the engines started our take-off roll. Me, I was just glad if I was going down, it was into warm water my body would be commended. There is a 25 kilo weight limit on gear bags. Additional weight can be paid at 8.5 ringgit per kilo. Also, interestingly you and your carry-on will also be weighed, but I was not charged additionally for the big camera bag and backpack I was holding in my hands while standing on the scale. I love this place. Would I come back... absolutely. However, I do not think I would make this a prime destination from the USA. But it is a great place to spend a week if you find yourself in Singapore, Indonesia or some other place within a single 2 or 3 hoursâ€™ flight to Kota Kinabalu. The Layang Layang photo shoot-out. Nikon D3, S&S MDX-D3, S&S YS250 (2), Inon 45 viewfinder, ZEN underwater dome, 14mm, 17-35mm, 60mm, 110mm. Visit my educational not-for-profit foundation "saveourseas.tv"
we have done the layang Layang shootout 2 years running and will be going again this year. great location great prizes ,nicely run. we both felt very welcome,,, we have recomended it to our friends. my wife and i really fell in love with the awsome unspoilt tropical reefs and the walls are just stunning , some do drop for 50meters a small step then drop into the deep blue . sponge and coral in PRISTENE condition . i think the wall diving is as good as PNG and the solomons best. as a westerner i really enjoyed the food and curry luksa for breakfast is a great way to start the day after the first dive . Edited by jugglematt, 22 April 2008 - 12:23 PM. Thanks for the Flikr link. Wonderful images. Have a great time at the photo shoot-out, it looks like it will be fun . I wish I could be there. I'll look forward to seeing your images from your trip. Edited by MatthewAddison, 22 April 2008 - 06:29 PM. yep, the shootout is a great event and a lot of fun! I truly enjoyed myself and the diving there last year.. I won't be there this year though..
Hi Matthew is it worth a macro nut and muck diver going to? Olympus E-520, 50mm macro, 14-42mm, Olympus housing with SnS 110a & Inon Z240-4 flash. That's a good question. A macro nut... yes, absolutely. There is a great deal to shoot and the divemasters will find it for you if you ask and if it is there. However, I do not think you will find the abundance of strange critters you would in Lembeh muck. But, the place is great and worth going to. You will come home with great macro shots and great memories. But you can combine LL easily with Mabul (Sipadan), which has fantastic critter diving. It's just a short hop from KK. i had no problem finding macro subjects, , the house reef is a decent critter dive , and i ffound good critters on the reef dives also . eg cowrie ,frogfish , nudibranch , gobys, sea horse . lots of stuff if you take the time to look. We will be keen to return in 2011 (several in the group are planning to return next year!). ;-) To us, the food at Layang Layang was wonderful! Our new French friend loved it too! Edited by xariatay, 10 June 2009 - 07:51 AM. Wow, serious wall of fish there in that second shot.